Number of Transjakarta passengers is increasing during Asian Games 2018.
" We are optimistic Transjakarta customers will continue to increase because Asian Games still lasts until September 2"
Transjakarta President Director, Budi Kaliwono said, before Asian Games, Transjakarta buses accommodated 600 thousand passengers per day in average. "But during Asian Games, it has significant increase. Highest passenger number is on last Monday which reaches 676,493 people," he informed, Tuesday (8/28). He explained, increased passenger number can be achieved due to support from all Transjakarta services, such as Rapid Transit Bus (BRT), non-BRT, and One Karcis One Trip (OK-OTrip) program. Moreover, services from Palmerah Station to Gelora Bung Karno (GBK), inner GBK, and outer GBK that reaches 35 thousand passengers. Transjakarta as Jakarta Provincial Government's BUMD is committed to support and enliven Asian Games 2018. 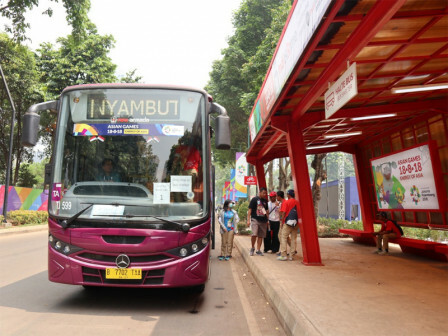 Transjakarta prepares 350 shuttle buses to take Athletes from Wisma Atlet (Athletes Village) to several venues. His side also provides 1,750 buses for regular service during Asian Games. "We are optimistic Transjakarta customers will continue to increase because Asian Games still lasts until September 2," he conveyed. His side also gives free rides for eight days on August 17, August 18, August 19, August 22, August 25, August 26, September 1, and September 2 in all Transjakarta routes.